Outdoor wedding popularity is on the rise. According to statistics offered by Hudson Valley Weddings, 35 percent of weddings are now outdoor occasions. Gardens and parks top the list of outdoor locales for weddings. Here in the south, plantations are also quite popular! Having a wedding outdoors can be a beautiful event. 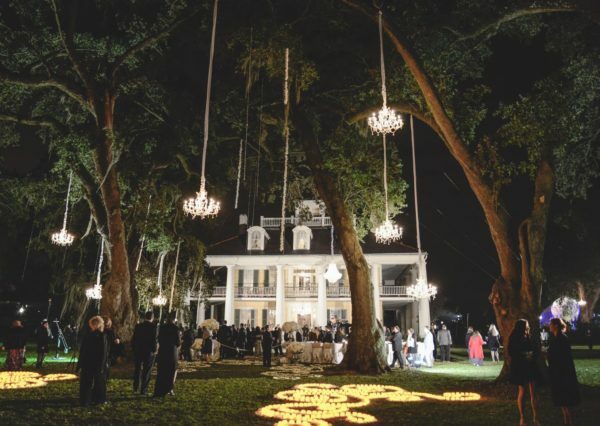 Getting married under the starry sky with small lights illuminating the aisle make for a scene of immeasurable beauty. As it is with all weddings, there is a lot of food, a lot of drinking, and a whole lot of dancing. Translation: that’s a lot of people will eventually have to go to the restroom. On average, there are anywhere from 120 – 150 guests attending a wedding. Some venues are forced to use septic tanks, and a lot of those tanks aren’t made to handle high volume. When someone goes to the restroom in this situation everyone is greeted with a not-so-lovely smell. Nobody wants that. Another situation to consider is long restroom lines. Given that this is an outdoor event and boys will be boys, some may take it upon themselves to try and find a secluded bush somewhere to relieve themselves. These situations can spell disaster on what is supposed to be your special day, and potentially the greatest day of your life. We understand that porta-potties don’t exactly spell elegance, but there are ways to disguise, decorate, and camouflage the units. Maybe some old rustic doors and fairy lights? Maybe a tent that’s facing away from the ceremony and reception? If you don’t mind the look of a few porta-potties, then maybe some potted shrubs and topiaries to spruce them up a bit. 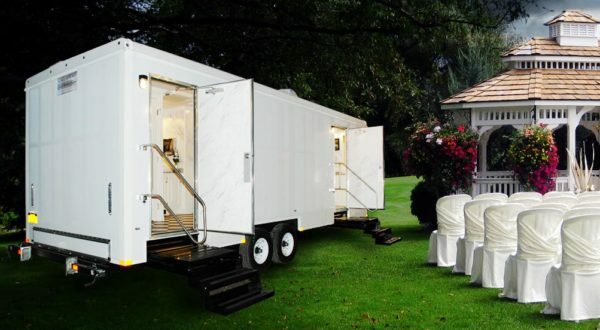 If you really dislike the idea of portable toilets being present on your special day, consider a restroom trailer. Think about them as complete restrooms on wheels. Our restroom trailers provide flushing toilets, vanity mirrors, and sinks with hot and cold water. For those who wish to treat their guests to the best of the best in mobile restrooms, we offer our gold-line restroom trailer which features wood floors, wood trim, and other premium aesthetic upgrades. We offer restroom attendants on request to further pamper you and your guests. While better looking than a big plastic outhouse, restroom trailers can still be an eyesore to some. 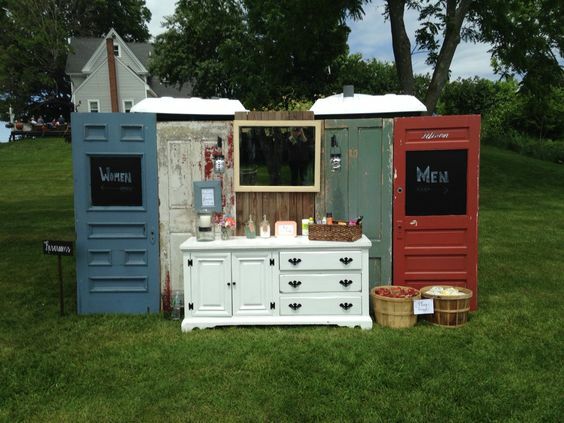 Employing the same creativity used to doctor the porta-potties, they can be made to look very inviting. If you have need of our wedding services, please don’t hesitate to call us at 1-888-768-6465. For more information about our wedding services, click here.